Maybole was saddened last week by the death of Jackie Conkie at the age of 85. He was a native of the town and had never strayed far for either work or leisure. In 1999, Jackie was one of the first recipients of a Scroll of Appreciation from Maybole Community Council for his services to Maybole Bowling Club. He will be best remembered for his long association with Maybole Bowling Club which he had joined as a young lad and which he had served as club secretary for many years. 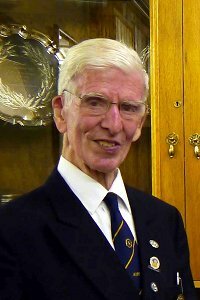 During his time in that post he had encouraged the founding of links with other local clubs resulting in inter-club matches which have fostered good relations and widened bowling circles, the last two links being with Seafield in Ayr and Coylton. The latter is contested annually for the trophy which bears his name. Jackie was Maybole Bowling Club’s longest playing member and was recently presented with a framed scroll to commemorate his 65th year of being a member. He was a great ambassador for the club and bowls. He was meticulous in everything he did and was involved in the improvements to the club in 1983 and compiled a book for the club’s 150th anniversary. He also served on Kirk Sessions latterly at Maybole Old and Maybole Parish Church carrying on his district duties until his failing health forced him, very reluctantly, to take a less active role.